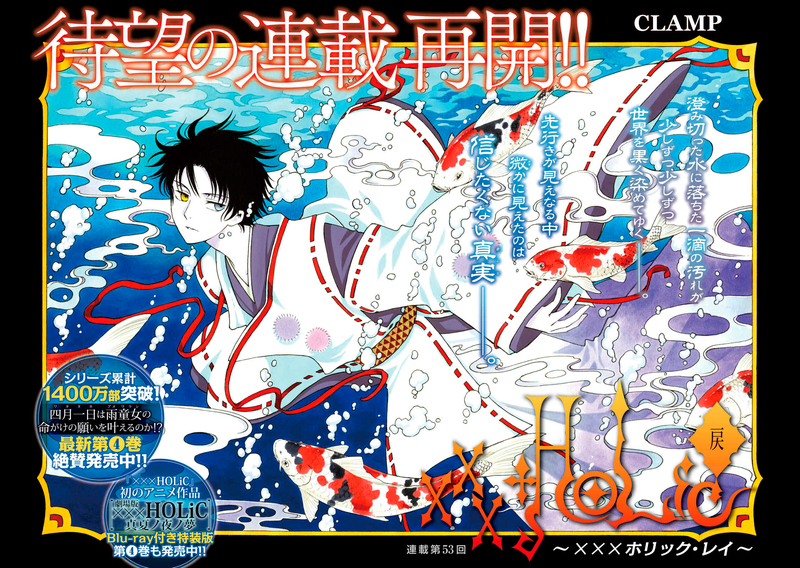 XXXHOLiC Rei is back after a 4-months hiatus! Gorgeous splash page! CLAMP should play with fish more often. We start with a dream sequence where Watanuki meets Haruka after a long time (he even says so himself!) They discuss the latest developments and also about Yuuko. Watanuki wakes up from the dream after a shocking discovery. Looks like there is a customer waiting for him, an ordinary customer (after a long time, too!). From what I could understand, the girl is having some sort of strange dream involving a cage…. I’m curious if Zashiki-warashi is related to that costumer and if so that’s why she has that strange dream, which she has something to tell Watanuki so the customer can tell Watanuki for her. That’s a good theory. Maybe she is the Zashiki Warashi from that world? Translation is up! I’m glad this came out tonight rather than tomorrow afternoon, since I’ve got work, haha. The customer has dark hair, so of course she can’t be ordinary, right? I’m glad that we’re progressing (slowly) on the current plot line rather than jumping on to something else, even though Watanuki seems to be taking it for granted that this “Witch of Dimensions” is Yuuko. So fast, thank you! I already updated the post with the translation link. Hey you do have a point, I can’t seem to remember any customer with dark hair! im unable to download the chapter on my computer, so is there somewhere else i can see the raws? i cant wait for them to be scanlated! it does sound like a decent chapter at least. from what i read of the translation, it seems to be moving forward! hooray! its not stalling!! That’s really strange… I am able to download it just fine. This isn’t the first time you had problems with my links, if I’m not mistaken. But MediaFire doesn’t require a program to be installed in order to download files. Unless it’s asking for a login? hmm… no its not asking for a login… it just wont download for me. like it keeps on blocking. the same happened last time too. Lorna, what browser are you using? Also, do you have a firewall or any kind of security controls enabled on your computer? It might be set to automatically block Mediafire and similar websites. ive just looked at the scans. wow! this chapter did not disappoint. how perfect seeing haruka again. seems like we’re going to see watanuki in action…? id love to see him in badass mode. id also love to see this zashiki/shuuka story get a decent length arc, instead of a few chapters worth. this current story is getting me excited for holic chapters again, and the plot is so far progressing nicely. this dimensional witch… he assumes too readily that its yuuko… but is it her i wonder? and that customer at the end, is she related to zashiki, or is she an alternate version of her? have we seen alternate versions of characters in holic yet? well apart from the syaorans and sakuras. ah! forgot to say how nice to get 18 pages instead of 10- 14 pages. the difference just a few extra pages make is huge! it makes the chapter more meaty/ well rounded and the plot flow quicker. whereas with the 12 pages we had to wait for a whole month just to see, for example- watanuki and doumeki to finish their conversation about alcohol, or whatever it is they talk about.